Separated computing, storage and networking environment, designed with speed and high-availability in mind. We are using SSD (Solid State Drives) as a performance foundation in our infrastructure. SSD massively outperforms traditional HDDs and are up to 20 times faster to access data. Your VPS will be provisioned in an isolated, private network, which will greatly improve its connectivity and boost the speed your page load by providing a dedicated channel for your data. Each component of your VPS â computing, networking and storage is redundant. We double each component of our infrastructure, in order to achieve high-availability and 99.999% of uptime. Updated by our staff of senior system administrators and on a daily basis, our web based firewall (WAF) makes sure your website is safeguarded from online threats. Your Virtual Private Server resides in a highly resilient, fully-redundant OpenStack private cloud deployment, operated by OpenStack trained and certified engineers. We are automatically and constantly snapping five copies of your VPS database and files, making sure you always have a way back. Restoration is provided for free of charge. Your VPS will be provisioned in a fully isolated, cloud powered hosting environment, allowing for greater security & monitoring by our team of system administrators. Updated by our staff of senior system administrators and on a daily basis, the web based firewall makes sure your VPS is safeguarded from online threats. Our network is very scalable and has more then enough of reserved resources to support even most unexpected traffic needs during sudden attacks of Denial of Service. Introducing anti spam firewall for spam email devouring which blocks any kind of spam emails your your inbox is receiving. Anti spam also restrict our own servers from SPAMMAIL. We use the latest technologies and most reliable partners to provide a stable service for all our servers. RAPTOR10 boost in-disk data transfers allowing smooth processing. Ace Class Datacenter in South Africa bunkered with no physical access from outside party. Hardware firewall only allows SSD transmission access to our Ukraine & Russian Datacenters. Customer satisfaction is the most important task for us and we do everything reliably possible to assist you. Although unmanaged, all our services come with 24/7/365 tech support. Fastflux TCP IP Switches are hosted over our Ukraine & Russian Datacenters which sole purpose is to connect strict proxy SSD access to our bunker servers hosted in South Africa. How does SilentExploits BULLETPROOF Servers work? We have come up with a strategy to be a truly independent when it comes to freedom of the press and data privacy. Our offshore countries are not a member of the European Union or The United States and, as such, can go on its own way. SilentExploits firm allows our customer considerable leniency in the kinds of material they may upload and distribute. What actually being in Bulletproof enviroment mean? 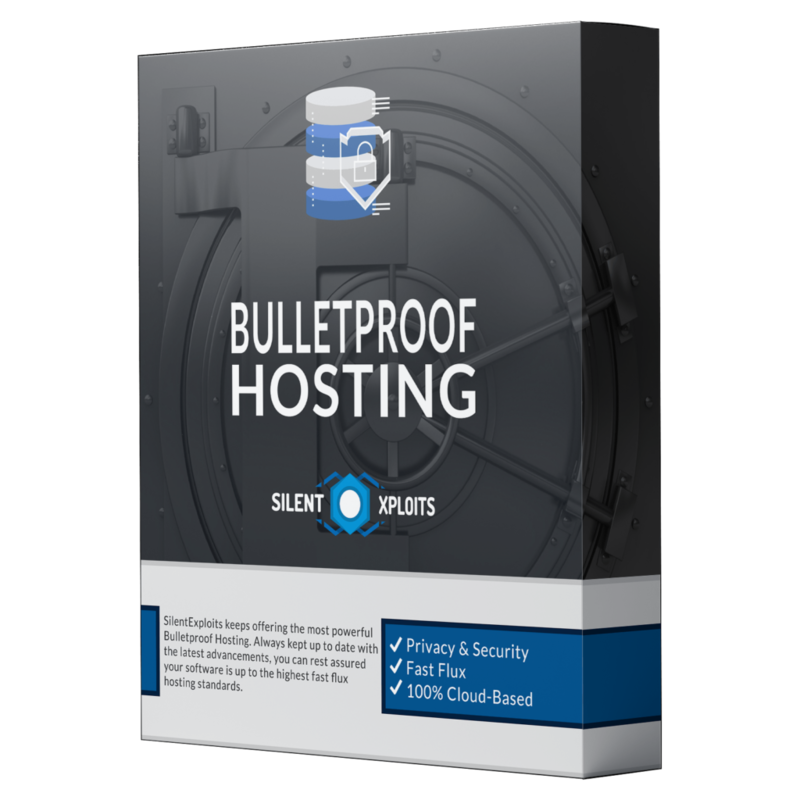 So, if bulletproof works like a normal hosting, is it as cool? After all, you only get one life. You might as well spend it working on something great. Unfortunately, the question is hard to answer. There is always a big time lag in prestige. It’s like light from a distant star. Bulletproof hosting provides you great work of safty encrytion. Strong as it will take five hundred years to crack. At the time, no one thought these encrypting were as important as we do today. So while I admit that Bulletproof doesn’t seem as cool as normal hosting now, we should remember that staying anonymous and encryption itself didn’t seem as cool in its glory days as it does now. It would have seemed very odd to people at the time that SilentExploits, would one day be known mostly as the guy with the strange nose in Bulletproof Hosting. How does Freedom of Speech laws work? The country your server files are hosted determines which freedom of speech laws you are subject to. You may not know that the United States is actually behind countries like Suriname and Jamaica when it comes to freedom of the press, so don’t rest too easy thinking your country won’t ever come after you. Never worry of your privacy being leaked, we do not log neither do we take any of your data while you register for an order. We just need an email address to deliver your services and let you know when you need to pay again. Fast-flux “motherships” are the controlling element behind fast-flux service networks, and are similar to the command and control (C&C) systems found in conventional botnets. However, compared to typical botnet IRC servers, fast-flux motherships have many more features. It is the upstream fast-flux mothership node, which is hidden by the front end fast-flux proxy network nodes, that actually delivers content back to the victim client who requests it. Flux-herder mothership nodes have been observed to operate successfully for extended periods of time in the wild. These nodes are often observed hosting both DNS and HTTP services, with web server virtual hosting configurations able to manage the content availability for thousands of domains simultaneously on a single host. Until late March 2007, we observed the appearance of only two primary upstream mothership hosts deployed and serving the many thousands of domains in flux, suggesting that this technique was primarily developed and utilized by small number of groups or individuals. Domain registrations of .hk, and .info were found to be among the most heavily utilized TLDs for registering fast-flux domains, but this registration abuse is most certainly shared amongst all registrars (as occasionally .com and other TLD domains are also witnessed).